Summary: An audacious, darkly glittering novel set in the eerie days of civilization’s collapse, Station Eleven tells the spellbinding story of a Hollywood star, his would-be savior, and a nomadic group of actors roaming the scattered outposts of the Great Lakes region, risking everything for art and humanity. 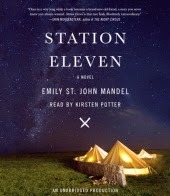 I am going to preface my review of STATION ELEVEN by Emily St. John Mandel by saying that I love the author! She is positively adorable and she's also an extremely gifted storyteller. With STATION ELEVEN, her fourth novel, she is finally getting the recognition I believe she deserves. This book has been getting rave reviews... from almost everyone. STATION ELEVEN begins a few days before the "end of the world as we know it." Arthur Leander is starring in a stage production of King Lear when he suffers a heart attack. Jeeven Chaudhary, an EMT who was once a member of the paparazzi, rushes on stage to perform CPR to no avail. Meanwhile, eight year old Kirsten Raymonde watches as the larger-than-life actor dies. Later that evening, Jeevan discovers that a massive flu outbreak is occurring around the world that is killing almost everyone within hours. He bunkers down with his brother and watches as the world begins to come to its end. Fast forward fifteen years and Kirsten has managed to survive the flu. She is now an actress with the Traveling Symphony, a group of performers who travel around what remains of the country and perform Shakespeare and songs. They arrive in the small community of St. Deborah by the Water and fall upon a truly bad guy who calls himself "the Prophet." Their survival is challenged by this violent man's beliefs and it's apparent that there will be a final conflict which will determine their fate. STATION ELEVEN is a fascinating story about survival and human nature as a whole. I found the entire novel to be intriguing, albeit quite scary; and I was very impressed with how Ms. Mandel wove together all of the various characters and stories. The novel weaves back and forth between the pre-flu world and the post-flu world, and it is both suspenseful and touching. Truly, she managed to accomplish quite a bit with this novel. If I'm being entirely honest, there were parts of this novel that made me uncomfortable. Ms. Mandel's description of the flu outbreak and the panic that ensued scared the crap out of me. And then, the remnants of our country were even more terrifying. I'm not sure I would have wanted to survive! Maybe it's because I was listening to the story rather than reading it, but I was extremely disconcerted by what the survivors had to face and what they had to do to survive. I was also saddened by their memories... and lack thereof! What I enjoyed the most about STATION ELEVEN, besides the wonderful writing, was how much it made me think. This book covered quite a lot about society and human behavior, showing both the good and the bad; and it definitely made me think about how we live our lives today. One of the best things I can ever say about any novel is that it made me think even after I finished reading it. STATION ELEVEN certainly did just that! STATION ELEVEN would make an excellent book club pick. In fact, a few members of my group are reading it now. There is a reading guide with sixteen (yes sixteen!) questions. Because the novel covers so much ground and so many interesting situations, there is a great deal to discuss. Some of the themes you might want to explore include loss, grief, survival, love, friendship, trust, sacrifice, and memories. In addition, some of the "smarter" book clubs might want to compare/contrast some Shakespearean themes with what happens in this novel. If you are looking for a smart, yet unusual story, about survival and basic humankind, then I highly suggest reading STATION ELEVEN. I think I'm the last person in the world to read this book. It sounds like it got under your skin. I loved this book precisely because it seemed like it could really happen -- and that made it so scary. I've loved all of Emily Mandel's writing, and this was no exception for me - but, yes, so scary because it's plausible!